While Transylvania may be known in popular culture as the home of Dracula, the incredible landscape and rich history of this region are not to be overlooked. Located in the Carpathian Mountains in central Romania, travelers flock here for outdoor activities and adventures such as hiking, skiing, and rock climbing. Further, the medieval towns and architecture scattered throughout the region are some of the oldest and best preserved in the country. As host of many festivals and events, Transylvania is a cultural center for foreigners and locals alike. And since most of Romania's tourism is concentrated here, you're sure to find a wealth of vacation ideas in Transylvania. Brasov: Nestled among the forested foothills of the Carpathian Mountains, charming Brasov is a must-see on any trip to Transylvania; despite its ugly outskirts packed with Communist-era factories and apartment blocks, the medieval core entices visitors with a network of medieval lanes, nearly unbroken city walls, and hilltop citadel. Sibiu: One of Transylvania's best-known gems, medieval Sibiu retains many architectural hallmarks of its long and storied Germanic past. The city is divided into upper and lower sections, each with its own attractions and local charms. Cluj-Napoca: A city of pleasant squares, striking steeples, and a backdrop of green hills, Cluj-Napoca offers a distinctly laid-back vibe despite being Romania's second-largest city; this popular student town pulses with both a daily energy and a frenetic nightlife scene. Sighisoara: The birthplace of Vlad the Impaler, hilltop Sighisoara is a true medieval-era masterpiece, as attested by its World Heritage-listed citadel, incredible clock tower, and seemingly endless expanses of defensive walls and tiny squares just begging for exploration. Turda: Known primarily for its famous salt mine, the town of Turda offers plenty more than its underground splendor, including a vibrant ethnic-Hungarian cultural scene, a historical church, and easy access to the stunning Turda Gorge. Hunedoara: Few places you'll see on your Transylvania holiday provide a stranger fusion of old and new than Hunedoara, where grey, Communist-era apartment blocks and monstrous factories transition suddenly into a glorious medieval town center, complete with a gorgeous Gothic-era castle. Alba Iulia: Despite its unattractive Communist outskirts, Alba Iulia in fact boasts an incredible citadel in its ancient center positively packed with beautiful churches, cathedrals, and homes, a testament to the city's long history first as a Roman regional capital and later as the head (briefly) of an independent Transylvania. Tirgu Mures: A wild mix of Romanian, Hungarian, and Roma influences, Tirgu Mures has endured a tumultuous history of ethnic conflict, invasion, and iron-fisted Communist rule, yet has emerged as a vibrant center of culture, Hapsburg architecture, and tourism in Transylvania. Poiana Brasov: Romania's most popular center for skiing, Poiana Brasov draws visitors from across Europe to its pristine mountain slopes teeming with trails and pathways, great for both snow sports and summertime hiking, as well as its abundance of hotels and cozy chalets. Bran Castle: Perched atop a forested hill surrounded by mountains, 14th-century Bran Castle (Dracula's Castle) and its warren of towers, courtyards, and luxurious rooms is well known for its association with the infamous villain, though in reality the ruler who inspired the character had little to do with this fantastical fortress. Black Church (Biserica Neagra): Home to exquisite Gothic decorations, a cavernous interior, and an organ featuring 4,000 pipes, the famed and fortress-like Black Church (Biserica Neagra) draws its name from a 17th-century fire that left its exterior coated in soot. Sighisoara Historic Center: Constructed originally by 12th-century Saxon settlers, the fairytale-like Sighisoara Historic Center forms the fortified heart of the old town, rising up on a hill and featuring charming homes painted in pastel colors, winding medieval lanes, and an impressive citadel topped off with nine surviving watchtowers. Big Square (Piata Mare): Sibiu's beautiful core is centered on the bustling Big Square (Piata Mare), and this 14th-century marketplace features a whole host of cafes, shops, and museums, as well as many of the city's most prominent (and colorful) buildings. Clock Tower: The dark spires and impressive stonework of Sighisoara's monolithic Clock Tower have stood as a guardian over the city for centuries; this turreted component of the local defensive fortifications features great hilltop views and a charmingly painted clock. Council Square: Ringed with attractive, pastel-colored buildings and accented by a bulky clock tower, Council Square serves as the epicenter of Brasov's ancient core and is a fantastic spot for souvenir shopping, kicking back with a drink, or simply a relaxing wander. Mount Tampa: Rising above Brasov's historical center, tree-covered Mount Tampa reaches a height of 900 m (2,952 ft) above sea level and offers visitors numerous hiking trails, spectacular views of town, and the name of the city in lights, Hollywood-style. ASTRA Museum: Traditional Romanian life comes alive at the outdoor Astra National Museum Complex, which showcases more than 300 historical buildings from around the country, ranging from rural homes and barns to factories and windmills, complete with an array of exhibits and artwork. Biertan Fortified Church: Among the largest of Transylvania's many castle-like cathedrals, the World Heritage-listed Fortified Church of Biertan is often considered to be one of the finest examples of its kind in the country, boasting a beautiful yellow exterior, a monolithic inner keep, and three separate rings of sturdy defensive walls. Transfagarasan Highway: Winding through the mountains along a backdrop of sheer cliffs, gorges, and slopes, the Transfagarasan Highway is a route that can help you travel efficiently on your Transylvania vacation; along the way you'll pass by both castles associated with the infamous Dracula as well as plenty of sheep. The three major centers of Brasov, Sibiu, and Sighisoara boast the lion's share of things to do in Transylvania, and one or two of these hot spots will be more than enough on their own to fill up a family vacation. Transylvania's many medieval city centers make for a wander worthy of a fairy tale: the array of colorful buildings, tiny streets, and impressive architecture is something even the youngest travelers on your Transylvania trip can appreciate. In addition to the big-name destinations, Medias and Sebes stand out among smaller towns. Heading out into the area's many timeless villages is also a good way to inspire young minds with a combination of culture and natural beauty; the cluster of nearly 20 villages around Sibiu are among the best places to see country life preserved as it once was, with plenty of locals in period clothing and fun farm-based activities available to the public. To get into nature, head for the surroundings of Turda or hit the slopes (or the resort) for a ski-oriented trip at Poiana Brasov. Positively overflowing with kid-friendly things to do, Transylvania is notable for its wide selection of top-notch museums dedicated to a variety of subjects. Though museums may not seem ideal for energetic little ones, the subject matter will often keep the kids interested for hours at a time. In addition to the well-known Ethnographic Museum of Transylvania and the Museum of Art, consider swinging by Sibiu's Museum of Steam Locomotives or Natural History Museum. 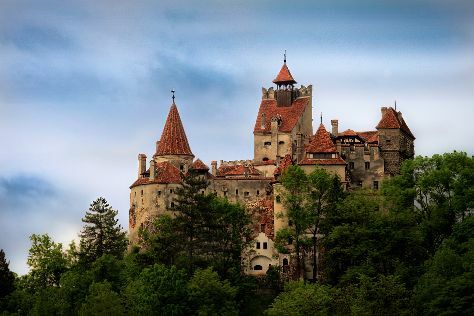 Transylvania also features a huge selection of castles to rival practically anything in Europe, from the unbelievable Corvin Castle in Hunedoara to the hilltop Rasnov Citadel. Not only will they keep the kids entertained with plenty of nooks and crannies to discover, open space for running around, and spectacular views, but any history buffs among the adults tagging along can get a great deal out of the visit. Of course, Transylvania's vast expanses of wild nature alone are responsible for a great deal of the region's charm and provide a fantastic outlet for energetic kids. Hiking trails, nature centers, and wildlife sightings abound at attractions like Piatra Craiului, Turda Gorge, and Scarisoara Ice Cave; any of these makes a great way to spend a day away from the hustle and bustle of the region's popular, and tourist-oriented, urban centers. Alternatively, you can opt for a more organized outside activity at Balu Adventure Park in Harghita Bai. Joining in on a tour of the Turda Salt Mine is an intriguing option, as older children especially may enjoy exploring this subterranean wonder. When in doubt for an activity to put on your Transylvania itinerary, rest assured that the province's great outdoors are up to the task of family fun. Keep in mind during your trip to Transylvania that despite relatively low prices for trains and public transportation, costs can still add up fairly quickly over the course of a longer trip or when traveling with a larger family. For that reason, renting a car may prove an economical and convenient option. It has the added bonus of freeing you from transport schedules and the need to shepherd young kids onto crowded public buses, trams, and trains. When it comes to churches, keep in mind that both Catholic and Orthodox establishments take services and prayers very seriously; children will need to be quiet and respectful during a visit to any religious site, so avoid busy service hours to make things a bit easier on rambunctious family members. Transylvanian food is, deep down, one of the most complex around, featuring an intriguing synthesis of styles; Romanian, Hungarian, German, and Turkish cooking, passed down through centuries of settlement, invasion, and trade, have all lent their distinct flavors to the local palate. By sampling some of the local specialties during your tour of Transylvania you'll come into contact with its history, as well. All sorts of hearty soups and stews feature heavily on local menus and in home cooking, and few things can warm you up during a brutally cold Transylvanian weather like a steaming hot bowl of "ciorba." The variations include pork soup accented with vegetables and tarragon, meatball stew, and bean soup: with white beans, onions, ham hocks, and a broth thickened with flour and topped off with sour cream, vinegar, and herbs, this delicious concoction is a true Transylvanian staple. "Lahnie de fasole cu afumatura," an alternative but similar dish popular during the holidays, combines blended bean paste, smoked meats, dill, and plenty of spices. Goulash is omnipresent, and this hallmark of the region's strong Hungarian influence is usually made with stewed meat and vegetables, though in Transylvania it's usually bulked up with delicious smoked pork and potatoes. To top it all off, you'll likely get to enjoy it straight out of the "bogracs," a heavy metal hanging pot usually cooked over an open fire. Chicken paprikash ("csirkepaprikas" in Hungarian) is another deliciously spiced must-try meal. In Cluj-Napoca, be sure to try "varza a la Cluj," a sort of disassembled version of the popular "sarma" (meat-and-rice-stuffed cabbage rolls)--think the Transylvanian equivalent of the naked burrito. Of course, the long history of Saxon settlement in Transylvania has also left a significant gastronomical mark in the form of all sorts of delicious sausages, breads, and dumplings. Roasted pork complemented with baked apples and cream is something attributable to this powerful Germanic heritage, as is Transylvania's delightful selection of walnut- and apricot-based cakes. The Saxon tradition of winemaking is another legacy here, and there are plenty of wineries and towns around the region, such as Tarnave, Jidvei, and Medias, where you can sample some tasty white blends. For beer-lovers, the city of Miercurea-Ciuc is famous for its widely exported brand. If you can manage to wolf down one of these filling meals during your trip to Transylvania, finish it off with a bit of local brandy, usually infused with fermented plum, apples, or pears and aged in wooden barrels. Traditional handicrafts abound throughout Transylvania, particularly in smaller towns, and can make a very interesting and attractive memento of your Transylvania vacation. Whether it's browsing through souvenir stands in Brasov or exploring local markets in Tirgu Mures or Medias, you'll be able to find all sorts of hand-painted objects, ranging from bowls and leather to luxuriously colored eggs and delicate lace clothing. Folk museums are often reliable places to get your hands on some of the aforementioned crafts if you have any trouble finding them while out on the town. If you're stopping by the Ethnographic Museum of Transylvania in Cluj-Napoca or ASTRA Museum, don't miss out on the chance to pick up a few traditionally made Saxon wooden toys painted with bright colors. Of course, it's tough to miss the Dracula-themed gear and items depicting Vlad the Impaler omnipresent across the region, particularly in the town of Bran and the ruler's hometown of Sighisoara. It's delightfully tacky, and not locally made, but you'll have no trouble finding the figure's likeness plastered onto just about any souvenir or trinket imaginable. Transylvania is one of the country's most developed regions, and European Union membership and a growing amount of tourism mean that you'll have no trouble finding plenty of big-name brands in major cities. Shops, stores, and galleries are often centered on a few main old town streets or around historical plazas like Big Square (Piata Mare) and Council Square, so head to such commercial centers for your fill of modern goods. Transylvania's long and storied history stretches back thousands upon thousands of years and is the product of countless invasions, settlements, and conflicts that have all left their indelible marks on the region. The area's Dacian population in the pre-Roman era built fortified cities like Sarmizegetusa (the ruins of which you can visit on your trip to Transylvania), which served as some of the region's first permanent population centers and grew further after their conquest by Rome in the 2nd century CE. Despite long periods of rebellion, the Romans managed to develop Transylvanian cities like Alba Iulia and Cluj-Napoca, bringing in settlers from around the Empire, and many theorists cite this involvement as an explanation for Romanian's place in the Latin language family. Conquered by the Hungarians in the 9th century, Transylvania became a part of the unified Kingdom of Hungary in the year 1000, contributing greatly to the rise of the area's influential Hungarian population. Primarily Catholic, the Hungarians constructed cathedrals and churches of their own, such as the St. Michael's Roman Catholic Cathedral. Head for Cluj-Napoca's Ethnographic Museum of Transylvania to learn more about this ethnic group's impact on the region. Alternatively, include the villages of Harghita County on your Transylvania itinerary, where the population is more than 85 percent ethnic Hungarian, or admire the informative displays of the Csiki Szekely Muzeum. Transylvania's position at a Eurasian crossroads left it often in the path of invaders and conflict, and the region's rulers realized that measures needed to be taken in order to fight off the hordes from Central Asia and the Turks from the south. Beginning in the 1100s, the Kings of Hungary invited Germans from Saxony to settle and defend the region's southern border, which had a profound effect on Transylvania's development. In the centuries that followed, these Saxon residents founded and created some of greatest cities of "Siebenburgen" (Transylvania), christening them as Kronstadt (Brasov), Schassburg (Sighisoara), Hermannstadt (Sibiu), Klausenburg (Cluj-Napoca), Mediasch (Medias), Bistritz (Bistrita), and Muhlbach (Sebes), along with numerous smaller towns. The Germanic Teutonic Knights also played a role, constructing imposing fortresses like the stunning Rasnov Citadel--which many visitors include in their tour of Transylvania. However, it's the Saxon fortified churches that perhaps rank most highly among Transylvania's attractions: these castle-like cathedrals often encompass entire villages and feature incredible stone bastions filled with cloisters, chapels, and monks' quarters. Don't miss out on visiting marvels (and World Heritage Sites) like Biertan, Harman, and Prejmer, the largest of all. It was during the 15th century, in the midst of a long-running Turkish invasion, when Transylvania's most famous (or infamous) figure rose to power: Vlad III Dracula, known in English as "Vlad the Impaler." Born into the ruling family of Wallachia, of which Transylvania was a part, Vlad III quickly developed a reputation as one of Europe's fiercest fighters, raiding lands occupied by the Ottoman Empire and wreaking havoc on Turkish armies. He became known during the 15th century for his brutality and bloodthirsty nature, and the punishments he inflicted upon his enemies were epitomized by his infamous impalement of Turkish prisoners for all to see. Though he was eventually defeated and killed in 1476, Vlad the Impaler understandably remains the subject of fierce debate, as different populations in Transylvania view him very differently. That said, his status as a Romanian folk hero is unquestioned. He gained even more notoriety after the 1897 publication of Bram Stoker's novel, "Dracula," which connected the famous ruler with both Bran Castle and vampire legend. Between 1526 and 1690, Transylvania was an independent principality, and though a vassal state subjected to the power of the nearby Ottoman Empire it retained its distinctive culture, a fusion of Romanian, Hungarian, and Germanic. You can see a slice of traditional Transylvanian life firsthand at the ASTRA Museum, an exhibition of buildings, crafts, and artifacts from around the region. After 1690, Transylvania became again a part of the Hungarian Empire, among the growing swathes of Habsburg family-controlled territory in Europe. It would remain as such until after World War I, when a defeated Austro-Hungarian Empire was sliced apart and divided, and Transylvania was ceded to Romania. Due to arbitration with Germany and Italy during World War II, Transylvania passed back to Hungary in 1940, only to be returned to Romania in 1945. The region's Saxon population all but disappeared in the immediate postwar period, when most of them left Romania for Germany and elsewhere. The rise of Communism and the regime of notorious dictator Nicolae Ceausescu in 1965 saw a great deal of turmoil in the region, including ethnic conflict between the area's Hungarian and Romanian populations. You'll notice plenty of Communist constructions in major cities, including seas of less-than-attractive concrete apartments and, perhaps more interestingly, the Transfagarasan Highway; legend has it that this road was built by Ceausescu to help transport troops and military hardware in the event of a Soviet invasion. Since the fall of Communism in 1989, Transylvania has risen to become the country's most popular tourist destination. Few images on your Transylvania holiday will be as iconic as its near-endless swathes of dense forests carpeting dark hills, topped off by the craggy peaks of the brooding Carpathian Mountains. Crisscrossed with interlocking ranges, Transylvania sits apart from the land around it, rising up on a plateau replete with winding rivers, jagged canyons, and sweeping valleys, most notably Turda Gorge. This rugged and mountainous terrain provides vantage points for fortresses like Rasnov Citadel and Bran Castle, along with fortified towns in Sighisoara and Brasov. In Brasov itself, ASTRA Museum serves as the old city's primary backdrop. West of Cluj-Napoca, the mountains give way to vast steppes and verdant hills, accented by striking rocky outcroppings like the 1,129 m (3,704 ft) peak of Szekelyko. As a region with significant Catholic and Orthodox Christian populations, Transylvania observes most common Christian holidays, with Christmas and Easter being the biggest. Celebrating and honoring individual saints and figures falls at different times throughout the year depending on the individual, denomination, and institution. Romanian national day on December 1 is a big deal nationwide, though the Transylvanian city of Alba Iulia hosts a particularly lively celebration thanks to its prominence as a former royal capital. Tirgu Mures Days, held during the last weekend in June, features tons of carnival-themed fun and performances along with a very festive atmosphere. For a taste of the music scene, head to Felsziget Festival at the end of July, which hosts rock performers and popular DJs in a raucous summer jam. Of course, Transylvania features a wide array of smaller festivals and local performances, so keep your eyes open during your holiday in Transylvania for local listings, sign boards, and fliers advertising all sorts of entertaining get-togethers, food displays, and celebrations. The height of a Transylvania summer, July and August, can become oppressively hot and humid, while the dead of winter in January and February can bring bitter temperatures and howling blizzards. However, sunshine is pretty abundant year-round. Thanks to the region's position on a mountainous, central plateau, these continental seasons can stick around longer than you might expect, so be prepared to dress for significant cold or heat depending on the time of your visit. However, the interim months can result in some very pleasant weather, and the warm days of spring and dry, cool days of autumn make a perfect time for a trip to Transylvania. Rain, in general, is relatively uncommon, though late spring and early summer features the heaviest precipitation, occasionally coupled with thunderstorms. To make the most of your time sightseeing in Transylvania, you'll need to combine multiple types of transportation, as many of the area's attractions lie in smaller villages, the countryside, and wilderness. Local bus networks radiate outwards from large cities, making getting out to small towns a breeze, though renting a car during your trip is perhaps the best way to ensure your plans aren't torpedoed by a less-than-ideal timetable. Keep in mind, though, that driving in Romania can occasionally be quite wild, so proceed with caution and don't take unnecessary risks on the road. Romania's rail network covers much of Transylvania, and you'll find decent connections between major cities run frequently and generally on time. However, train travel can be relatively slow given the distance covered, so plan accordingly. Train rides between popular destinations such as Brasov, Sibiu, and Sighisoara will often take you through huge sections of beautiful mountain and forest scenery, so grab a window seat to enjoy the mini-tour. Like the rest of the country, Transylvania is primarily Romanian-speaking, and the vast majority of residents speak this Romance language as their native tongue. However, Transylvania has long featured a significant Hungarian-speaking minority; close to 1.5 million Hungarian speakers live in Romania, and most of them within the bounds of Transylvania, accounting for close to 20 percent of the region's population. In the smaller ethnic-Hungarian villages of Szekely Land and elsewhere, as well as in larger cities, you'll find dual-language signage galore. Small German-speaking minorities also cling to existence in some isolated areas, though their numbers are shrinking and many speak Romanian as well. If your Transylvania itinerary takes you through tourist hot spots like Brasov, Sibiu, or Sighisoara, you'll find a significant number of locals that speak English, particularly among the younger generation. However, don't count on English alone to get you by--many older folks in Transylvania instead may know varying levels of German, French, or Russian in addition to their native tongue. As you prepare for your tour of Transylvania, keep in mind that a little bit of the local lingo goes a long way: a few simple words in Romanian (or Hungarian, as the case may be) make you stand out from the average tourist and are always much appreciated.